The students in the International Justice Clinic work with activists, lawyers, diplomats, scholars and NGOs at home and around the world to develop and implement advocacy strategies concerning accountability for violations of human rights law. Clinic students pursue research, engage in on-the-ground fact finding, conduct interviews in cross-cultural settings and prepare written and oral reports of their findings. Students focus on oral and written advocacy, coalition building, legal research and legislative drafting. 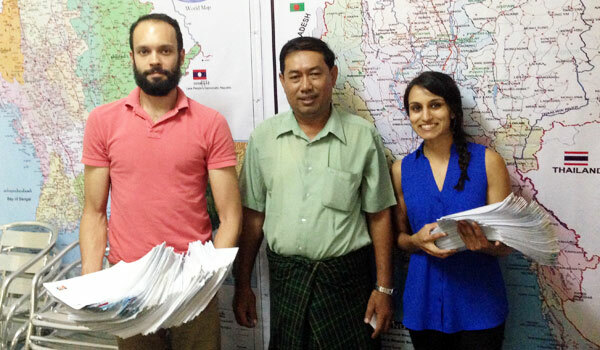 Sasha Nichols ’14 (at left) and Shaleen Shanbhag ’14 (right), with a partner activist in Yangon, display the surveys collected from former political prisoners in Burma. The Clinic has been involved in a number of major projects in recent years, including promoting the interests of former political prisoners in Burma/Myanmar, preparing a shadow report on U.S. border issues for the treaty-based Committee on the Elimination of Racial Discrimination (CERD) and advancing global support for the International Criminal Court, especially in the UN Security Council. The Clinic is also working with the Los Angeles County Human Relations Commission to address human rights implementation at the local level, reporting on countywide efforts to implement human rights obligations of the United States and building a permanent mechanism to monitor human rights at the local level. In June 2014, Clinic director Professor David Kaye was named the United Nations Special Rapporteur to monitor, promote and protect freedom of opinion and expression around the world. Clinic students will support the Special Rapporteur work by investigating problems in such areas as the protection of journalists, artists, academics and various “new media” practitioners (like bloggers), the impact of surveillance on free expression, the right to access government information, the regulation of hate speech and other subjects that touch on the international right to freedom of expression. Clinic students also will explore specific country situations and help develop regional networks of defenders committed to free expression.